Sea Shanties Old & New - Robert Palomo | Maritime folk music by Robert Palomo "From Russia with Love" | Blog : Harwich Here We Come! 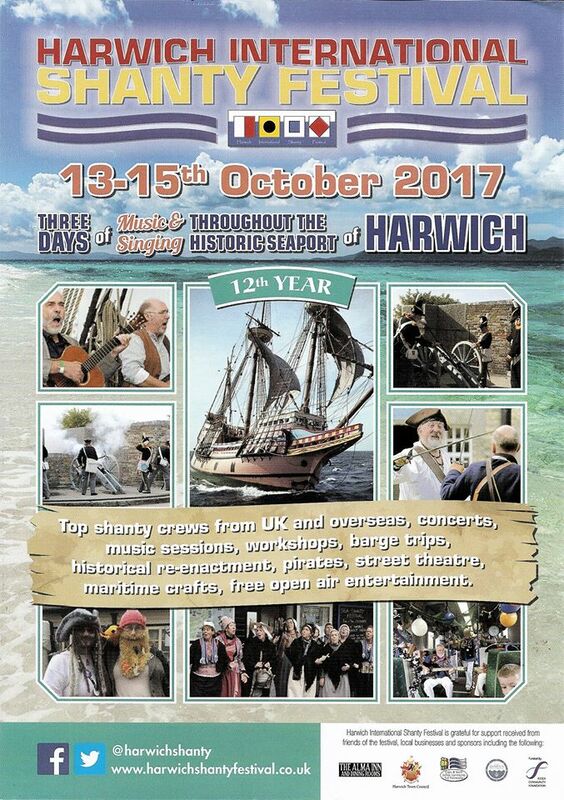 Now that's it's officially posted on their site, I can announce that I'll be performing my "new old sea songs" at the Harwich International Sea Shanty Festival, happening from 13-15 October, 2017. I've been fortunate to have traveled quite a bit around Europe, and I've wanted to visit England since forever, but have never managed to. I've read so much English literature over the years and I'd really like to see something of the country. What was most gratifying for me was that, although I had approached them about the 2018 festival thinking it was too late for 2017, when the organizers heard my music they decided to invite me for this year. Perhaps I'm doing something right musically after all! Because sea songs are generally not their best with just one voice, a couple of my mates from the Shanty Choir MIR, both natives of the Isle, and fellow long-time expatriate residents of Saint-Petersburg, have joined me to form a new trio expressly to work on my original music. Named with the Russian sailor's cry for a man overboard... "Za bortom! ", which we whimsically translate to English as "Men Overboard". Our first gig will be Harwich. You can read more about the trio and meet the other members over on the Za Bortom Trio web page. As of this posting, I still don't know the performance schedule. If you're in the UK, or otherwise might come to the festival, watch the festival site for updates. I'll post here as soon as I know what's what. Definitely don't hesitate to come hear us and lift a pint or two with us!